Without actually intending it to be any sort of theme, I've read a number of time-travel books this year, and enjoyed all of them. 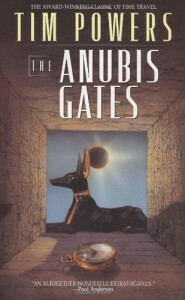 The Anubis Gates was the most recent, and I picked it up not knowing that it was a time-travel story; I simply wanted to read more Tim Powers, as I really liked the other books of his that I'd read. This one, as it turns out, is vintage Powers. In true Tim Powers fashion, this is at its heart an alternate history novel - that is, history with magic and a lot of other weirdness thrown in. It doesn't let you languish at all, as Powers keeps the plot moving forward at a near break-neck speed for the majority of the book. I liked this about it, but found that the character development could have been accentuated a bit more, almost as if character was sacrificed for the sake of action. That said, Professor Brendan Doyle was a pretty fascinating character (though I would have really liked to see him grapple with the body switching scenario a little more). As is typical for a Powers novel, if you simply list the story components used in the book, it sounds pretty ridiculous - time-travel, a werewolf, a clown crime lord, murderous gypsies, magicians, simulacra, Lord Byron, Egyptian gods...and so on and so forth. The really incredible part is that Powers makes it work, which in such a fast-paced book is quite something. The only other minor issue I had with this one was a certain paucity of prose. I wouldn't say that the other Tim Powers books I've read (On Stranger Tides and The Drawing Of The Dark) had fantastic prose, but the writing served the story and didn't stand out. There were a few moments in this book, however, where I actually thought to myself, "Hmm, he might have been able to say that better," which drew me out of the story a bit (something prose is certainly not supposed to do). Although this didn't happen often, it was enough to make me knock a star off the rating. I would recommend this book to anyone who wants that most rare of all books: a really good stand-alone fantasy novel.